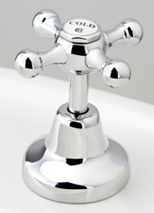 Domestic Tapware Style Roulette® One of our most versatile and venerated styles. Roulette looks great in classic and contemporary spaces, in any and all of our finishes. SKU codes will generally begin with RU. 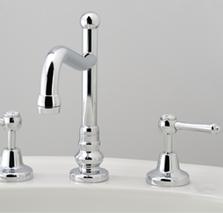 Domestic Tapware Style Heritage® Our Heritage range is our flagship style for classic restorations. The butterfly shaped cross handles are absolutely beautiful in our various brass finishes. Even though the name is Heritage, when finished in Chrome it provides a modern twist to this style. When bib / pillar top assemblies are upgraded to Rapid Action the exposed bonnet will be replaced with the dome sheath from the Roulette series, more information regarding this can be found on the Rapid Action FAQ. SKU codes will generally begin with HE. 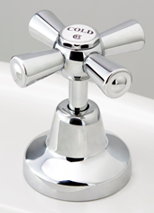 Domestic Tapware Style Roulette® Lever Beautiful in all metal finishes and also featured on our Olde Adelaide sets. 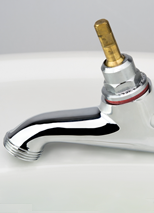 The Roulette Lever series of tapware (excluding Flick Mixers) is supplied standard with our 'Rapid Action®' mechanism which is equivalent to 'Ceramic Disc' in terms of 1/4 turn function but superior in execution. A full explanation of the advantages of our 'Rapid Action®' mechanism can be found in the Rapid Action® (1/4 Turn) FAQ. SKU codes will generally begin with RL. 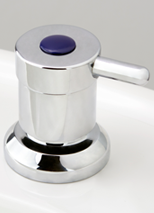 Domestic Tapware Style Roulette® Lever with Coloured Lever Inserts Coloured lever inserts allow for added flare on your tapware. Our inserts are not plastic or ceramic, they are made from brass. 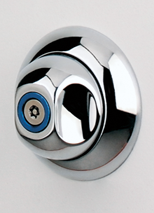 You will find optional upgrades on all Roulette Lever sets to have coloured lever inserts. Diverter levers can also be upgraded in the same manner. Standard colours are White, Gloss Black, Matte Black, Almond Ivory, Heritage Green & Burgundy. Other colours are priced on request. I like this handle style so how do I select items with it? Roulette Levers with Coloured Lever Inserts are a customisation option selectable on all Roulette Lever items and items with Roulette Lever handles in the Olde Adelaide style collection. The next step is to continue to the Roulette Lever or Olde Adelaide collection to select a specific product. From there, selecting your preferred metal finish happens on the individual product page. By default most products will load up with Chrome Plate (CP) finish pricing. Once a finish and any upgrades are selected the SKU (Stock Keeping Unit code) will update on the page. This SKU is the code to use on a purchase order along with a note of the preferred colour of the lever inserts. 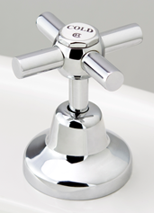 Domestic Tapware Style CB Ideal Seaview® One of our crisp contemporary ranges, the 'CB Ideal Seaview Series' is often installed in Chrome, Brushed Satin and Raw Brass finishes. 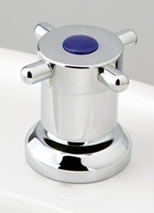 The 'CB Ideal Seaview Series' of tapware is supplied standard with our 'Rapid Action®' mechanism which is equivalent to Ceramic Disc in terms of 1/4 turn function but superior in execution. A full explanation of the advantages of our 'Rapid Action®' mechanism can be found in the Rapid Action® (1/4 Turn) FAQ. 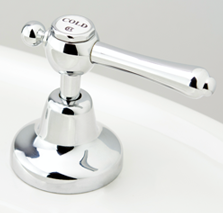 Domestic Tapware Style Roulette® Lever Wall Mixers Our solid machined brass wall mixer with solid brass cover plate. Domestic Tapware Style Roulette® Lever Horizontal Flick Mixers Our solid forged and machined brass flick mixers with various outlet styles. 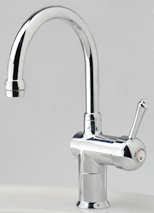 Domestic Tapware Style DB Mixer™ Series The DB Mixer Series is our domed top style mixer, as standard it uses a Roulette Lever spoke. Like with the Roulette Lever range, coloured inserts can be added to the DB Mixer Series. Please see our Coloured Inserts Guide for more information on available colours. Custom stying of the spokes can be assembled or manufactured on request. For example using a Roulette Capstan style spoke with the dome. The base height can also be manufactured to suit the required application. 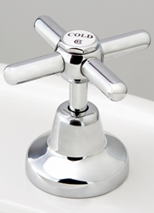 Domestic Tapware Style Olde Adelaide® Olde Adelaide is a range that is unified by a distinctive outlet shape named after our home city, and combines our Heritage styling with our Roulette Lever and other handles. Beautiful in all metal finishes. When combined with our Roulette Lever handles it is supplied standard with our 'Rapid Action®' mechanism. 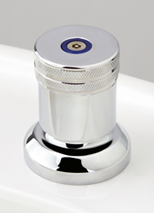 Roulette Lever also has the option to add coloured inserts to your tapware. Our inserts are not plastic or ceramic, they are made from brass. Standard colours available for fast delivery are Black, White, Almond Ivory, Burgundy, and Heritage Green. Other colours are available on request. 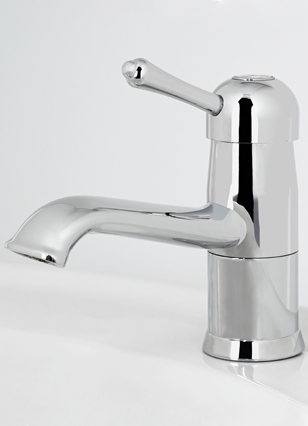 Commercial Tapware Style Bellevue® Bellevue is a smooth contemporary handle styling, suitable for both commercial and domestic spaces. This style uses solid colour indicators for hot (red), cold (blue) and rainwater (green). SKU codes will generally begin with BV. 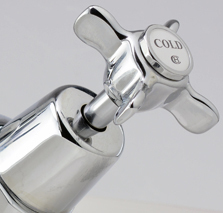 Commercial Tapware Style Bellevue® MK2 Handle Upgrade The Bellevue MK2 version of this style is designed to be more vandal resistant and uses stamped "H" and "C" letters which are forged as part of the tap head rather than indicator inserts. It also uses a circlip and locknut to retain the handle to the spindle. You will find the option on all Bellevue sets for selecting this handle upgrade. Bellevue MK2 is an upgrade option selectable on items in the Bellevue range. The next step is to continue to the Bellevue range to select a specific product. From there, selecting your preferred metal finish happens on the individual product page. By default most products will load up with Chrome Plate (CP) finish and with the standard Bellevue handle pricing. You must select the Bellevue MK2 Upgrade to select this handle style. Once a finish and any upgrades are selected the SKU (Stock Keeping Unit code) will update on the page. This SKU is the code to use on a purchase order. 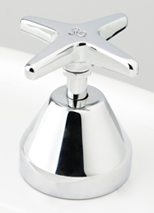 Commercial Tapware Style Celestial® Celestial is one of our laboratory and hospital ranges, with a contemporary down-swept star shape. 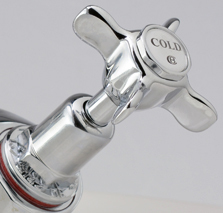 It uses large red and blue indicators for hot and cold. SKU codes will generally begin with CE. 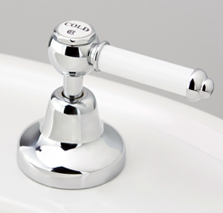 Commercial Tapware Style Celestial® Lever Popular for hospital and laboratory environments. Also suitable for old age and mobility impaired situations. The Celestial Lever style uses our Rapid Action® (1/4 Turn) spindles as standard for simple maintenance. A full explanation of the advantages of our 'Rapid Action®' mechanism can be found in the Rapid Action® (1/4 Turn) FAQ. Levers are available in 3 standard lengths, 115mm, 150mm and 180mm. (Select items are limited to 115mm lever length due to space limitations). If intending to use this style in domestic situations we recommend upgrading to engraved indicator buttons. Pricing for this upgrade can be found on the this range's product pages. SKU codes will generally begin with CL. 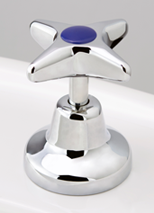 Commercial Tapware Style Torrens® Capstan Torrens Capstan took its design cues from that of a manual lathe turret. Suitable for contemporary designs and commercial environments. This style uses our Rapid Action® (1/4 Turn) spindles as standard for simple maintenance. A full explanation of the advantages of our 'Rapid Action®' mechanism can be found in the Rapid Action® (1/4 Turn) FAQ. SKU codes will generally begin with TC. 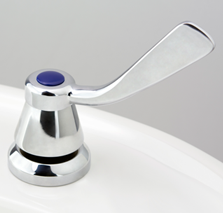 Commercial Tapware Style Torrens® Lever Another version of the Torrens Capstan, the Torrens Lever retains a single spoke. Suitable for contemporary designs and commercial environments. SKU codes will generally begin with TL. 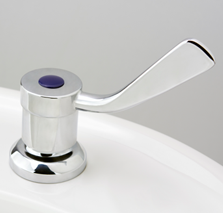 Commercial Tapware Style Torrens® Flared Lever Torrens Flared Lever like the Celestial Lever is popular for hospital and laboratory environments. Also suitable for old age and mobility impaired situations. The Torrens Flared Lever style uses our Rapid Action® (1/4 Turn) spindles as standard for simple maintenance. A full explanation of the advantages of our 'Rapid Action®' mechanism can be found in the Rapid Action® (1/4 Turn) FAQ. SKU codes will generally begin with TF. 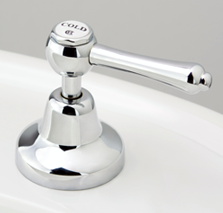 Commercial Tapware Style Gaol Safe Series Our most secure anti-vandal tapware is our gaol safe range. 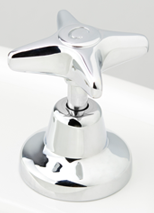 Commercial Tapware Style Contemporary Contemporary is a general component style that mostly covers our D-Type spindle options. 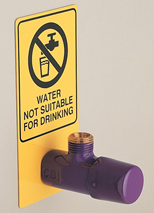 Commercial Tapware Style Reclaimed Water Cistern & Bib Taps Reclaimed water taps are colour coded purple and paired with metal signage (unless ordered as spare parts). Domestic Tapware Style Roulette® Capstan Taking design cues from our Torrens Capstan Commercial Range, Roulette Capstan, provides another style option for our Roulette Series. Roulette Capstan's straight with rounded end spokes provide a contemporary variant of our classic Roulette handle. You will find the option on all Roulette sets for selecting this handle style variation. Roulette style variants are a customisation option selectable on items in the Roulette series and items with Roulette handles in the Olde Adelaide style collection. The next step is to continue to the Roulette Series or Olde Adelaide collection to select a specific product. 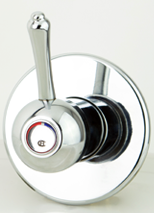 Domestic Tapware Style Roulette® Modern A modern spoke style for Roulette Series handles. 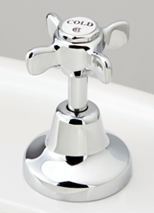 Domestic Tapware Style Roulette® Redeux Roulette Redeux, provides a great style option for our Roulette Series. Like the standard Roulette handle, this variant looks great in classic and contemporary, and in any of our metal finishes. 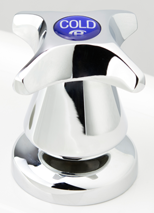 Custom Tapware Styles Made to Order Options (Bespoke Options) We are capable of manufacturing customised handles. 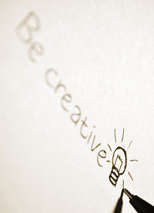 Pricing is determined by the time involved in manufacturing the customisation. This section helps serve as a guide to what is possible. June 2018: This is a new resource page for our website, more information along with photos to be added soon.